I need to take a vacation. Posted in Inspiration and tagged Shopping, Travel, Women's Apparel on March 15, 2013 by coffeeandwinter. Sorry folks, this post isn’t me rambling about the good weather Arizona has been having lately. 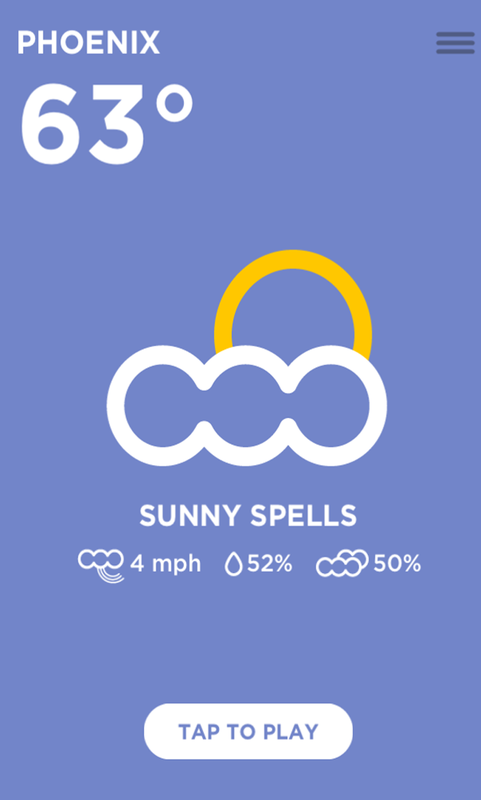 I’m obsessed with an app called Good Weather. Not only is it stylish and well made, every weather pattern has a fun game to play. Now granted the games are pretty much the same (i.e. tap the sun becomes tap the moon at night), but I don’t even care. They are so addicting. Head on over to their website to see a much cooler display of the app. PS: what that picture above doesn’t show you is the weather in Phoenix today will be an astounding, record breaking, 94! Posted in Misc. and tagged Technology on March 15, 2013 by coffeeandwinter.